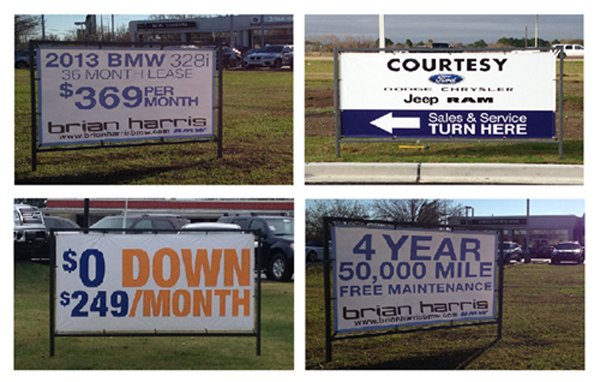 MyDealerSupply.com exclusive Outdoor Banner Frames are a free-standing, easy to use installation solution for many advertising or marketing needs. They can be installed (or removed) in less than 15 minutes. Banner Frames are extremely lightweight and very simple to install, making it easy for anyone to use them. Use two together to create a v-shaped frame that can be seen in traffic from all directions. You can purchase new banners for the frame and get numerous uses out of it. The banner attaches to the frame easily with zip ties. It will leave a long lasting first impression on your clients and customers. The patent-pending banner frame is manufactured from the highest quality industrial grade materials. Structural fiberglass, steel structural brackets, riveted construction and corrosion resistant materials guarantee your frame will be in service long after all the others have failed, with none of the problems of inferior methods. Installation of this frame is a breeze. The frame itself assembles with just 4 bolts and the included Allen wrench. You drive the 2 enclosed studs into the ground with a hammer (they only need to go in about 12 inches) and slide the frame on top. Made of a rugged structural fiberglass they will last for years without damage or wear. They collapse down into a box that is 6 square inches.